Although Phoebe’s husband, Chuck is not a trainer at Thornridge Manor, it is unfair not to devote a page highlighting his involvement in the business. After meeting at the “Blessing of the Hounds” on Thanksgiving Day in 2002 for the Elkridge Harford Hunt Club, Chuck is now most certainly a horseman (albeit by default). Behind the scenes, with a loyal and supportive attitude, Chuck is always available to our friends at Thornridge Manor!!! Master Mojito Maker at the Legacy Races -- Chuck even grows fresh mint!!! Since 2002, Chuck has attended every horse show that Phoebe and Claudia have competed in. Not only is he the official trailer driver, but he can always be spotted along the arena short end with a video camera in hand. Chuck has transported our sale horses throughout the East Coast -- from Michigan to Florida. Chuck is a talented artist in landscape and hardscape. His day to day contributions to Thornridge Manor’s beautification and maintenance are lengthy. To name a few, Chuck has installed our stone-paver entrances, outdoor stone mounting block, and numerous garden designs. In addition to meticulously maintaining the lawn and field care at our 90 acre farm, Chuck is always improving our facility features. He has installed our discrete manure containment system, sawdust containment system, and all of the automatic water systems to every field. Chuck believes that the farm is always a work in progress…Phoebe wonders what great improvement will come next!!! Chuck's most recent contributions to Thornridge Manor has been the installation of a beautiful outdoor arena AND amazing individual lockers for the boarder's tackroom. 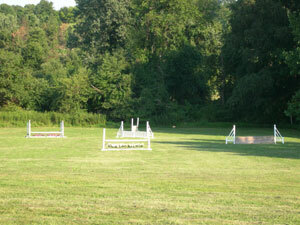 In 2009, Chuck expressed an interest in handling all of Thornridge Manor's young horses at Breed Shows. He also preps all of our youngsters for inspections. He is very patient and talented with the horses!! Windsong FV is awarded MMPS Status and Top Scoring American Bred Mare for the entire 2009 AHHA Inspection Tour!! In 2010 Chuck won AA Handler at Dressage at Devon with Dressed To Kill. Calvin was only a yearling! Another foal gravitating toward Chuck -- Victory on Wallstreet.